The Phoenix colocation market is ascendant, and is rapidly emerging as a destination for the largest players in hyperscale computing. It is currently experiencing a data center building boom, with hundreds of megawatts of potential capacity in the pipeline. The Phoenix region benefits from power and fiber infrastructure, and growing competition among service providers. Many Phoenix businesses experienced challenges over the past five years, but data centers have been a success story in the market. Data center users and operators have been extremely active in Phoenix recently, spurring an increase in supply to meet the demand from users both in and out of the market. As the Phoenix business climate has improved, it has created opportunities and growth for data center users and operators from across the United States. And in terms of policy, Arizona’s politicians have increased the appeal of the market to data center users by offering 10-year tax breaks on both data center equipment and labor services. 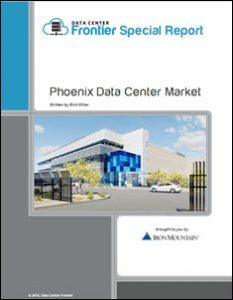 Download the new Data Center Frontier Special Report, courtesy of Iron Mountain Data Centers, that provides market analysis, and information on the business environment and major players in the Phoenix data center market. And for further coverage, check out Data Center Frontier's page dedicated to the Phoenix Data Center Market, that will provide the latest stats and info on this quickly growing area that is becoming a leading market in the colocation industry.